Today was an interesting day. Well…maybe interesting isn’t the right word because actually most of it was boring. I headed out this morning to visit the Indian Visa Office. We are going to India at the end of February and need visas. I had everything I needed including a map. I found the office and discovered that while the number I had just pulled was 79 they were only on 35 and there was only an hour and a half until they closed for lunch. Number 79 was not called before lunch and at 11:50 they told us in Japanese that we would have to come back at 1:30. I am so glad that I understand more Japanese than I can speak! I ran some errands during lunch and got in line about 1:20. I was finished at 2:30 and now all I have to do is go back on February 16 to pickup our passports and visas. As I was walking home from the station I realized that I had forgotten about my photo for today and then I saw the coolest garage in my neighborhood. Parking space is definitely a premium in this crowded city. You have to provide a document confirming that you have access to a parking spot before you are allowed to buy a car! 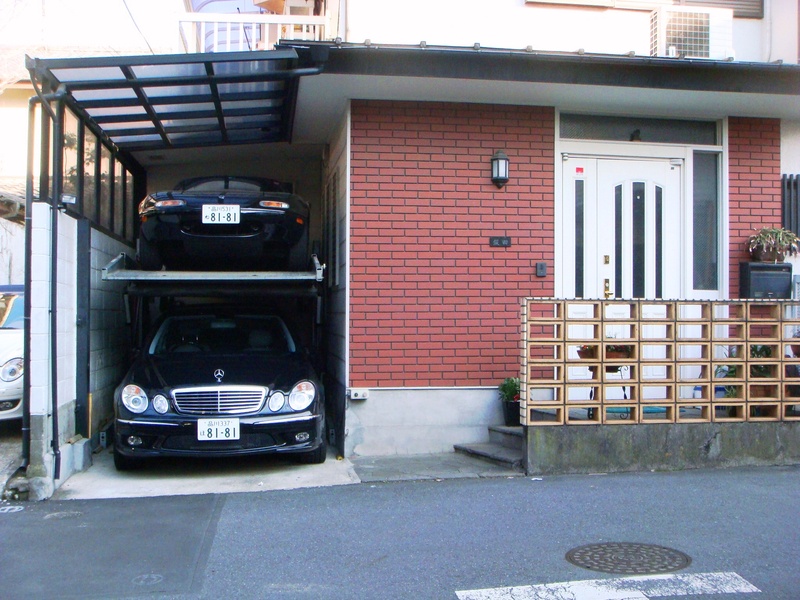 Two car families are definitely unusual, but this family figured out how to have 2 cars with only one parking spot. In case you didn’t know, we don’t even own a car here.